Hot air balloons in flight. 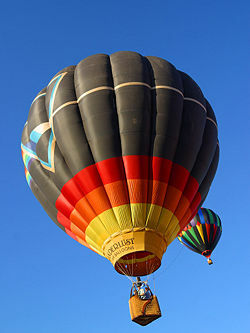 Hot air balloons are the most popular type of buoyant aircraft. Hot air balloons were the first type of aircraft to carry humans. The first one was built by the Montgofier brothers and flown in Paris in 1783. Hot air balloons are distinct from gas balloons in that their buoyancy is obtained by heating air, typically with a propane burner, rather than using an unheated gas such as Helium. This page was last modified 13:15, 8 June 2009.